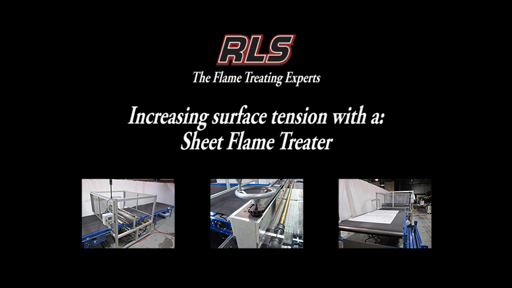 This flame treatment machine is used to increase the surface tension and dyne level on large plastic sheets, aluminum sheets, door panels, and any other flat that is up to 6 feet wide by 15 feet long. The sheet is placed on the first conveyor and brought towards the flame. The machine senses a part, and if the flame isn't lit, the part is stopped and the flame is lit and verified. The sheet is then advanced through the flame at the proper speed and travels onto the outfeed conveyor. It can them be manually taken off the conveyor, or continue onto another conveyor. This machine produces dyne levels upwards of 70 dyne, and can have an optional ion bar and air knife installed to assist in cleaning the sheets of warehouse dust or other contaminants. A simple crank handle makes adjusting the burner simple for different product thicknesses. Additionally the operator can choose a product or thinkness on the HMI, and sensors on the burner can fault if the height is not appropriate for the product chosen. With hundreds of these machines sold around the world, this truly is the most popular sheet flame treater on the market today. RLS custom designed burner system that would sits between the two conveyors. Burner system section to has a stainless steel wire mesh belt that will be synchronized to the in and out conveyor speed and can easily withstand and disperse the heat from the burner so it does not get hot. 64” (or whatever length required by customer) single slot ribbon top burner. Crank adjustment for the up/down movement of the burner. Flow gages on the gas and a butterfly valve with a low pressure gage on the air for flow control readout. Jam detection photo eye to sense if the part has been in front of the flame too long and it will shut down the system. Automatic ignition system and flame safety. Two E-stop buttons provided on flexible cables to mount to the ends of each conveyor. One is mounted on the main enclosure operating panel. Full operations manual with CD of all schematics and plc program.